Tissues and organs are built, maintained and rebuilt through the collective actions of many cells, in a highly structured 3D environment. The fundamental principles governing these processes are not well understood. Existing paradigms largely result from studies of isolated cells cultured at low density in petri dishes. 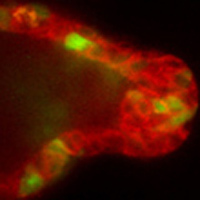 We use time-lapse microscopy to watch tissues assemble cell-by-cell, signal-by-signal. We have already discovered that epithelial invasion in 3D is highly context sensitive and operates on different principles than cell migration in 2D. In the Ewald Lab, we propose to dissect epithelial growth into a series of discrete changes in cell behaviors and molecular signals within its constituent cells. We seek to identify molecular regulators of tissue growth and invasion that will aid in the development of targeted cancer therapies. It is my guiding hypothesis that careful comparison of the cellular and molecular mechanisms underlying both normal and cancerous growth will yield deeper insights into the fundamental underlying biology than study of either process alone. Please explain your general research strategy. The movement of cells is uniquely captivating; each seems so autonomous, so driven, so active. However, we do not fully understand how a cell perceives its environment and generates directed, responsive cell movement. Much of what we do know is based on the study of isolated, immortalized cells, cultured at low density. By contrast, cells in tumors live a crowded life surrounded by, and interacting with, other cell types, the extracellular matrix (ECM), and diverse signaling molecules. I have developed novel techniques to apply long-term time-lapse confocal microscopy to visualize cellular behaviors and molecular changes in 3D cultures of primary tissues embedded within the ECM and interacting with diverse stromal cells. 3D organotypic cultures allow me to contrast different epithelia under identical microenvironmental conditions or to contrast genetically identical epithelia under different microenvironmental conditions. This ability to parametrically evaluate the effect of single or coordinate changes in the microenvironment on epithelial cell behavior provides a unique opportunity to test which of these changes is functionally significant to invasive and metastatic potential. I use a shared set of imaging, genetic, and molecular interference tools to study epithelial morphogenesis, whether from normal or cancerous, mouse or human epithelium. I am extending my studies of normal murine mammary epithelium to mouse models of cancer and to primary human normal and cancerous mammary epithelium. 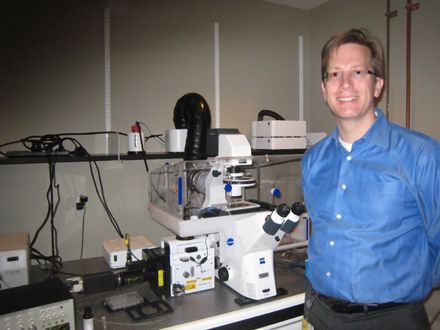 Live cell imaging, utilizing the Yokogawa CSU family of confocals, has been the foundation of my research since 2004. Many fundamental aspects of normal and cancerous epithelial growth have never been imaged. We have an enormous amount of work ahead of us just to understand the cellular basis of epithelial growth in 3D tissues. We use live cell imaging of 3D cultures of normal or tumor epithelium to describe the basic cell movements and rearrangements underlying branching morphogenesis, tumor invasion, and tumor dissemination. As soon as we begin to understand the “normal” sequence of events we begin to perturb the system, by systematically varying the ECM conditions, the cellular composition, or the gene expression of the cultures. Time-lapse again becomes critical as we seek to understand how these changes in individual cellular or molecular components of the tissue affect the resulting tissue level phenotypes of growth and invasion. Why did you choose to use the CSU? In my graduate studies I made very successful use of the Zeiss series of laser scanning confocals (310, 410, 510). I still use the Zeiss 710 for multiphoton imaging. 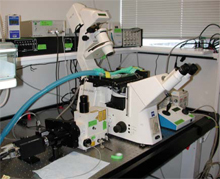 However, I became familiar with the CSU10 in 2003 as it enabled us to do a really novel set of experiments imaging the cellular interactions between mammary tumors and immune cells in different tumor microenvironments in live mice. I was in Zena Werb’s lab at UCSF at the time and Mikala Egeblad and Bryan Welm had just begun a pioneering series of time-lapse studies in intact mammary tumors. When I joined the project the preliminary results were very promising, but we wanted to build an optimal instrument to capture cell dynamics in tumors with high sensitivity. We tested six different systems, a mixture of spinning disk, laser scanning, and slit scanning confocal microscopes. The CSU10 system really stood out for its speed of acquisition and reliability and was the clear best performer in our tests. As we designed and built our custom imaging system with the Solamere Technology Group, we had to test and replace many components, but not the CSU. With the CSU10 we just had to connect it to the microscope and align its mirrors every year or so. It really functioned very well through a long series of experiments. The results of our tumor-stroma imaging study were recently published in Disease Models and Mechanisms1. We also recently wrote a book chapter describing our microscope and in vivo imaging techniques in the 2nd edition of Live Cell Imaging from Cold Spring Harbor Press. Egeblad, M. et al. Visualizing stromal cell dynamics in different tumor microenvironments by spinning disk confocal microscopy. Dis Model Mech 1, 155-167; discussion 165 (2008). Two fields with different tumor microenviropments imaged in a same mouse. Leukocyte imaging in a live MMTVPyMT mammary carcinoma. When I set up my lab here at Johns Hopkins I wanted that same speed and reliability, and I built a new confocal system with Solamere, centered around the CSU-X1 manual scanhead. 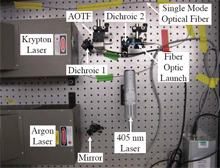 It is even more sensitive than the CSU10 and clearly delivers a higher fraction of the laser light to the sample. How are you currently using the CSU? One of the key features of our two confocal systems is that they are configured to collect large numbers of movies in parallel. We routinely collect 10-100 movies at a time, for 10-100 hours. This has been really critical as we study several processes that show significant variability over time. By collecting more movies, and by collecting our mutant and wildtype movies at the same time, we are able to control and account for variability rather than ignore it. We recently published the first ever description of the cell movements and rearrangements that underlie mammary branching morphogenesis. I choose to focus on the mouse mammary gland as my model system because the majority of its epithelial morphogenesis occurs in the postnatal animal and it serves as a useful model for human mammary development and neoplasia. Most studies of cell motility at the time focused on single cell types moving in 2D using forward-oriented actin-rich protrusions1. I was convinced it was important to study mammary epithelial morphogenesis in 3D, with ECM and multiple, interacting cells types. The expectation was that epithelial tubes elongated via specialized cells at the tip, using forward-oriented actin-rich protrusions2. To test this model, I used our CSU10 confocal microscope to observe the cell behaviors that drive branching morphogenesis. I observed that ductal elongation was accomplished by a multilayered epithelium, within which cells rearranged vigorously. Surprisingly, cells at the elongation front lacked forward-oriented actin protrusions, but elongated free of basement membrane coverage. Ductal elongation resulted from a balance between forward movement by luminal cells and restraining movement by myoepithelial cells, while bifurcations coincided with sites of myoepithelial cell migration3. We are now building on that study by using shRNA and genetic techniques to understand the cell-cell and cell-matrix interactions that drive branching morphogenesis. Lauffenburger, D. A.& Horwitz, A. F. Cell migration: a physically integrated molecular process. Cell 84, 359-369 (1996). O'Brien, L. E., Zegers, M. M.& Mostov, K. E. Opinion: Building epithelial architecture: insights from three-dimensional culture models. Nat Rev Mol Cell Biol 3, 531-537 (2002). Ewald, A. J., Brenot, A., Duong, M., Chan, B. S. &Werb, Z. 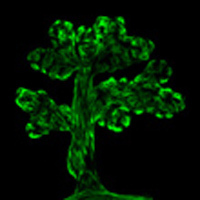 Collective epithelial migration and cell rearrangements drive mammary branching morphogenesis. Dev Cell 14, 570-581 (2008). 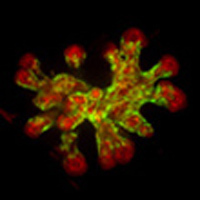 Multilayered epithelial elongation in a Sca-1- EGFP/CellTracker Red-labeled organoid. Myoepithelial (ME) cells in control organoids are closely adherent and reflect the pattern of branching morphogenesis. Smooth muscle actin positive (SMA+) myoepithelial (ME) cells in vivo reorganize during ductal morphogenesis from an elongate to a stellate morphology. What are the good points/bad points of the CSU? My favorite aspect of the CSU-X1 is the speed and sensitivity. Our one wish is that someday it will be able to accommodate different pinhole sizes so that we can optimize the combination of pinhole size and objective lens numerical aperture. I am actively building my new lab now and am recruiting a mixture of cell and developmental biologists, biomedical engineers, and cancer biologists and oncologists. This interdisciplinary cross-fertilization is very stimulating and has already led to new insights. Scientifically the lab is focused on understanding the interplay between the epithelial cell and its microenvironment in normal development, cancer invasion, metastasis, and chemotherapeutic resistance. I am a proud father of a two and a half year old daughter, Ellie, and am happily married to Shannon Marshall. We enjoy travelling together (especially to California) and outdoor activities. I personally really enjoy cooking, particularly barbequing, and drinking really good beer and coffee. I am an avid football, baseball, and hockey fan. I still follow the teams from my childhood home, Philadelphia. It was a very good year in 2008, with the Phillies winning the World Series. I have great hopes for the Eagles this year and am still watching the Flyers, despite their troubles. 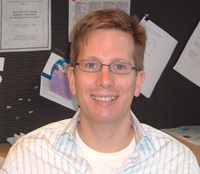 We got to know Andy when he was at Zena Werb lab. where Mikala and Andy with other lab members had built up really advanced live animal imaging system and accumulated tremendous amount of high quality data. Now that he opens his own lab., we do expect his further contributions to elucidate the very basic nature of cancer through the live cell imaging!